The new 18-hole championship golf course at Baxter Creek Golf Club is open to the public and offers great value - high quality at affordable rates. 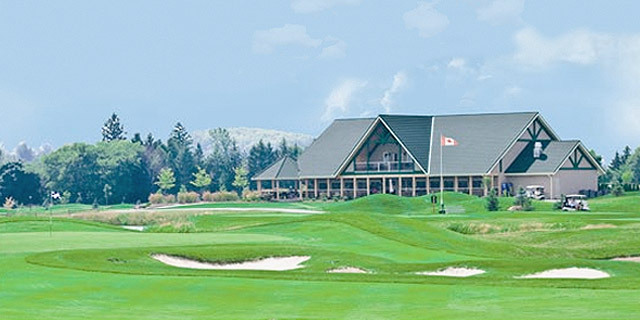 Golf Architect David L Moote, designer of Golf Digest’s 2004 Best New Course in Canada (The Rock, Muskoka, ON), has considered every design aspect of the landscape to provide enjoyment for guests of all golfing abilities. Mr. Moote has respectfully retained the character of the Larmer family farm while sculpting exciting course features. Rolling fairways plus classic time period Stanley Thompson/Donald Ross-esque greens and bunkers reflect a “Highland” or “Big Sky” flavour interspersed with holes meandering through established woodlot, naturalized areas and along the picturesque Baxter Creek. Course design, construction and on-going operations reflect a commitment to the highest standards of Environmental Responsibility.